Valerie Gray: Charles Knight: Educator, Publisher, Writer (The Nineteenth Century). Aldershot, Hants and Burlington, VT: Ashgate, 2006. Pp. xxxii + 233. Cloth £ 50.00. 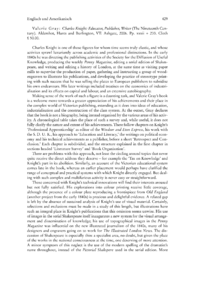 Charles Knight is one of those figures for whom time seems truly elastic, and whose activites sprawl luxuriantly across academic and professional distinctions. In the early 1840s he was directing the publishing activities of the Society for the Diffusion of Useful Knowledge, producing the weekly Penny Magazine, editing a serial edition of Shakespeare, and writing and editing a history of London, at the same time as visiting paper mills to supervise the production of paper, gathering and instructing a group of woodengravers to illustrate his publications, and developing the practice of stereotype printing with such success that he was selling the plates to European publishers to subsidise his own endeavours. His later writings included treatises on the economics of industrialisation and its effects on capital and labour, and an extensive autobiography.